I read this article and found it very interesting, thought it might be something for you. The article is called Delhi, Seeking 381% Subsidy Rise, Complains About New Delhi and is located at https://archive.indiaspend.com/cover-story/delhi-seeking-381-subsidy-rise-complains-about-new-delhi-17837. The devolution of financial power by New Delhi—the seat of India’s central government—continues to roil the states with the provincial government of Delhi rebelling, saying it would lose Rs 25,000 crore ($4 billion) over a decade. In the course of presenting an interim budget last week, Delhi Finance Minister Manish Sisodia complained that since India’s capital is a union territory, it would not be able to cash in on recommendations by the 14th Finance Commission to increase central taxes to states from 32% to 42%. “Had this recommendation been applied to Delhi, then Delhi would have received approximately Rs 25,000 crore during the award period (2015-2020),” said Sisodia, whose budget reveals his efforts to cobble together funds for electricity and water subsidies, which he intends to boost by 381% over a year. A warning of Delhi’s already troubled finances came when hundreds of unpaid municipal sweepers dumped garbage on the roads last week. IndiaSpend has reported how Tamil Nadu, India’s leading welfare state, rebelled against the recommendations of the 14th Finance Commission. These stands contrast with that taken by Jammu & Kashmir, where Finance Minister Haseeb Drabu said he would not go “begging” to Delhi for funds, as reported earlier. 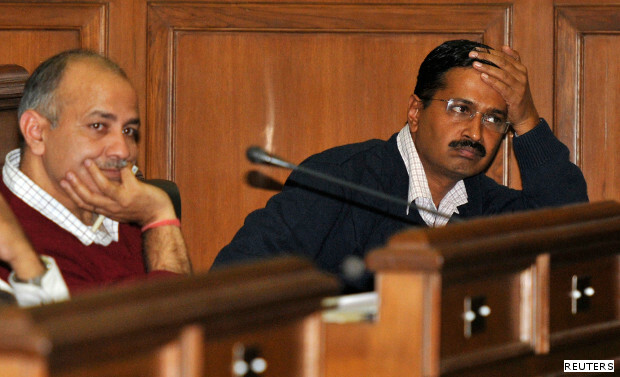 Sisodia also argued that tax-sharing laws were detrimental to Delhi’s services-dependent economy. Budget documents confirm the minister’s point: The national capital’s grant in lieu of a share in central taxes has indeed remained constant at Rs 325 crore. As in Tamil Nadu, new subsidies do not help balance the budget. The implementation of two key election promises of Sisodia’s Aam Aadmi Party (AAP)—a 50% reduction in power bills and 20,000 litres of free water per month—is expected to cost Rs 351 crore in 2014-15. Yet, the minister proposed to reduce spending for 2014-15 by 5%, from Rs 36,766 crore to Rs 34,790 crore. Plan expenditure–used to create assets and invest in infrastructure–will drop to Rs 15,450 crore (from the budget estimate of Rs 16,700 crore); non-plan expenditure–mainly used to pay for the water and power subsidies, interest, salaries and other routine bills used to run government–to Rs 18,440 crore (from Rs 19,066 crore); and centrally-sponsored schemes–such as the National Health Mission and the Universal Education Scheme–to Rs 900 crore (from Rs 1,000 crore). For 2015-16, Sisodia has proposed an 8% increase in spending, taking the budget estimate to Rs 37,750 crore. Next year’s budget includes an increase of 16.5% in non-plan expenditure to Rs 21,500 crore, which means continuing subsidies and government spending on itself; Rs 15,350 crore plan expenditure (reduction of 1%); and Rs 900 crore for centrally sponsored schemes (no change). The major jump in non-plan expenditure is likely to be the subsidy for power and water, from Rs 351 crore in the revised estimates for 2014-15 to Rs 1,690 crore for next year, a 381% rise. Given the number of overlapping authorities, some controlled by central government departments, others by local government, land is another bone of contention between Delhi and New Delhi. Money spent to buy land from the Delhi Development Authority (DDA), run by the Union government, could be spent on development of the city’s infrastructure, Sisodia said in his speech. The minister promised a full budget and to “work in complete partnership with the common man for (sic) addressing their issues . . . and for preparation of future plans”.